Valentine's Day is the #2 holiday for last-minute gift shopping1, and consumers are increasingly turning to their smartphones to help them plan their celebration. In our personal lives, we write the perfect message in a card and attach it to the perfect gift. In our professional lives as search marketers, we try to write that perfect message in our ad copy and attach it to the right landing page, but this hasn't always been easy. That’s why we are excited to share our latest enhancements to DoubleClick Search which will help you quickly find the ad copy and landing page that your customers will love - this Valentine's Day and beyond. Using search, 50% of consumers lookup brands they’ve never purchased2. Being there with useful information can help you win the love of new customers. Ad copy testing in DoubleClick Search helps you test new ad copy in order to make sure your campaigns are having their greatest impact. 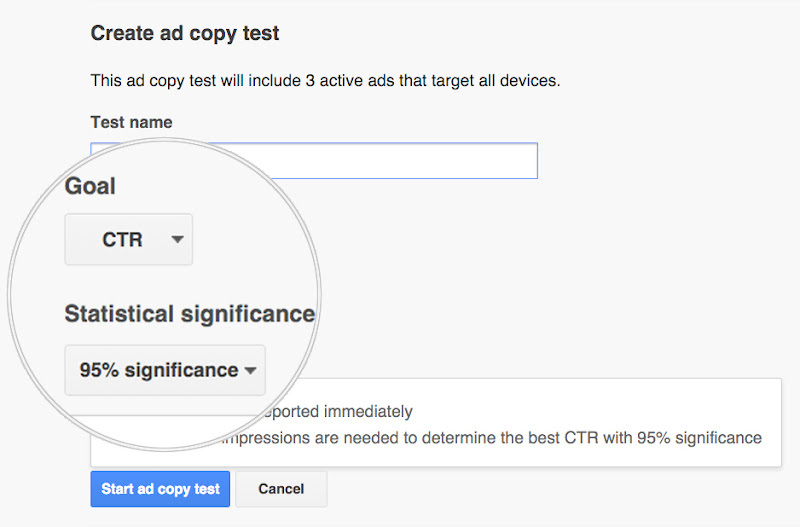 Ad copy testing works by normalizing the variables that can impact campaign performance such as flight dates, device type, and display frequency, and measuring the performance of what matters most - the ad copy. Step 2: Choose a test goal such as click-through rate, action rate or revenue. When your test is over, you can make changes to your campaigns directly from the testing interface. To learn how to use ad copy testing in DoubleClick Search, watch our training video or read about it in the Help Center. With so much last minute shopping, brands that find ways to be useful to consumers in the moments when they are seeking information for their purchases will win. So, when a consumer clicks one of your search ads, which page should you show? A promotional page? A product details page? A DoubleClick Search landing page test helps answer this question by randomly splitting ad traffic among multiple landing pages on your site. For AdWords engine accounts, we’ve added the ability to specify the device(s) consumers used to reach your landing page in order to ensure you have the most actionable insights about your page performance, no matter what device a consumer used to get there. We're excited to see DoubleClick Search customers use the mobile landing page test to optimize the journey for their customers from mobile search to mobile landing page to action. To learn how to start a landing page test, visit the Help Center. Ad copy testing and improved landing page testing in DoubleClick Search are just two of the many ways we are enhancing DoubleClick Search to help save you time and boost your performance. If these features make a difference for your business, let your account manager know. We'd love to hear about your success. 1 Google Trends, January 2013-December 2015, United States.